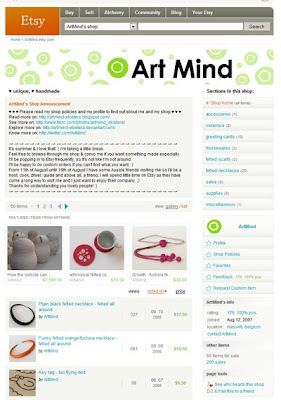 One year ago in the beginning of August I found this really cool site called Etsy. I didn't sign up right away but it took me a few days to actually believe that it all this cool stuff was actually for sale. Then I signed up and started to browse more and more, adding favorites and hearting sellers. I always loved creating and since I quit my evening ceramic classes, I thought it was time to fill up that time with something useful and wonderful: opening an Etsy-shop myself. I had my first sale on the 29th. I was a very lucky and happy seller and still remember I couldn't believe I actually sold something. The person who bought my first item also happened to be the very first person who put me in a treasury. Marcela has a shop on Etsy too and we still convo each other once in while. She is a supersweet woman and great Etsian. Soon I became addicted to treasuries and I found the European Streetteam that I joined right away. We chat in a forumthread almost everyday and it feels like they are all so close even though they live far away. I have met so many kind and warm people through Etsy. It has brought the world right into my home and I love it! I'm still excited with every sale I get, just because I can yet write another envelope to some wonderful destination.